Topic: Eldar, Exodites, Corsairs and Croneworlders! 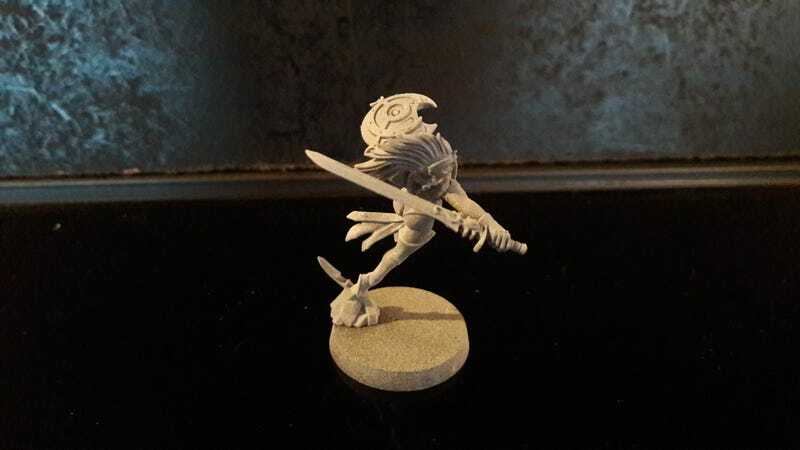 Re: Eldar, Exodites, Corsairs and Croneworlders! Now. Question about the Death Jester. 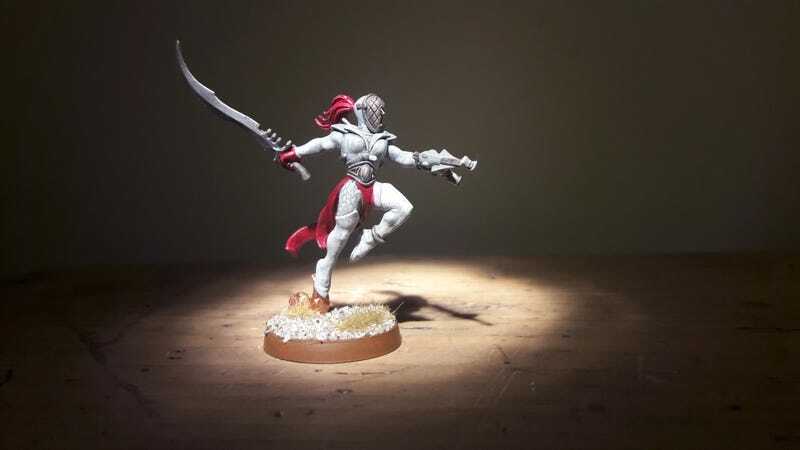 ...or do i paint him in the same troupe ghostly colours, and make two more troupes, one grey on black so i've got a light, dark and twilight aspect to it? Eldar, Exodites, Corsairs and Croneworlders! 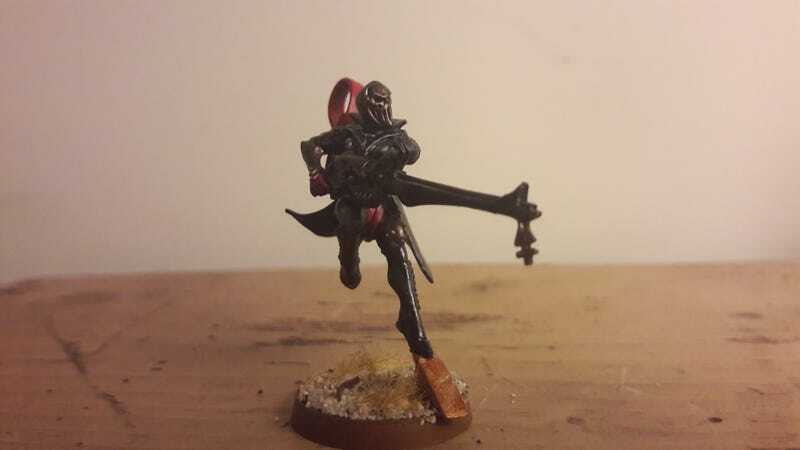 I'd actually go with a black theme for the Death Jester. I think it would really help him standout. For the Shadowseer, Death Jester and Solitaire I would do something unique... but thats just me. If I feel it suits the character of the model better I usually break up the paint scheme. Like with my Rangers and counts-as Scorpions... I didn't want my stealthy guys running around in red and gold armor. Its different with the Harlies... they aren't worried about camouflage, but I'd give them colors which would suit their station. Thats just me though.. I'd fascinated to see what direction you go in regardless. Good luck! I could change the Troupe Master's coat to red to make him stand out too, but I think I prefer the whited out look. Oh, and I've got a Solitaire planned that's probably way way beyond my painting skills :S if I do a light and dark troupe, I'd want to do a Solitaire starting as dark on his left and then blending through to white on the right. Lord knows how it'll turn out as I've always been terrible at blending! Was rooting through my bitzbox and stumbled upon a last pair of Harlie legs so I made myself the Solitaire I was planning! That Solitaire is crazy cool. 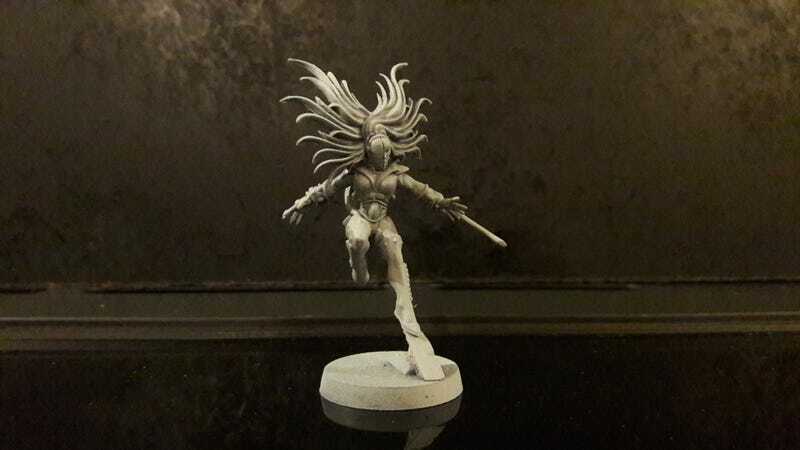 Nice use of what I'm guessing is Daemonette hair! You make the conversion work sound so easy. It isn't and you've done it very well. I've got an idea in my head for her male counterparts, but that will have to wait til I get some more Harlequin legs. While I normally have very little time for named characters in my armies (and the general blinginess of recent 40k character models), these guys have really grown on me. 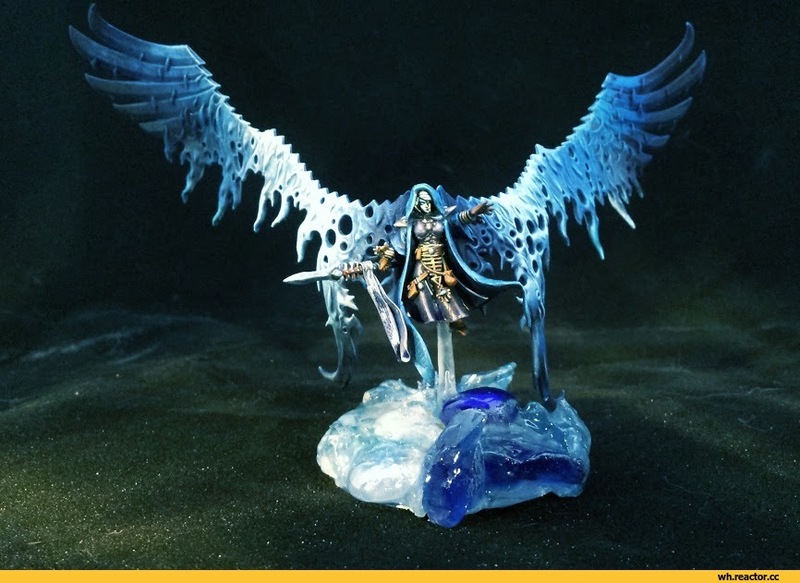 However, the main thing that was racing through my mind is how utterly perfect the Avatar of Ynnead's base body is for my Croneworld unfettered psyker counts-as Lord of Change. Your Solitaire conversion is bloody marvellous. The hair compliments the pose so well that anyone would think that this was a bought model. 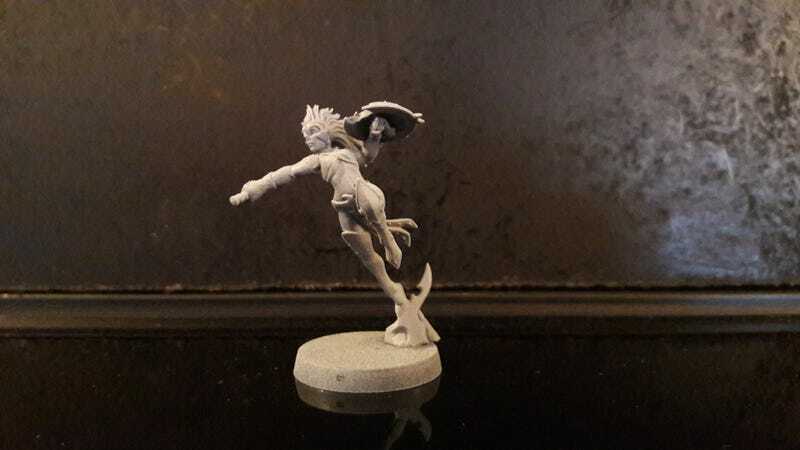 I can't believe you have to cut the faces off some models for your conversions that level of work just blows me away. Daft question but how come you had to use a right handed arm for a left arm. Could you not have cut the hand off of a left arm and got a similar result? Really loving that Solitaire conversion! The posing is great and you've made a really good choice of bits! Can't wait to see what you do with the new stuff! 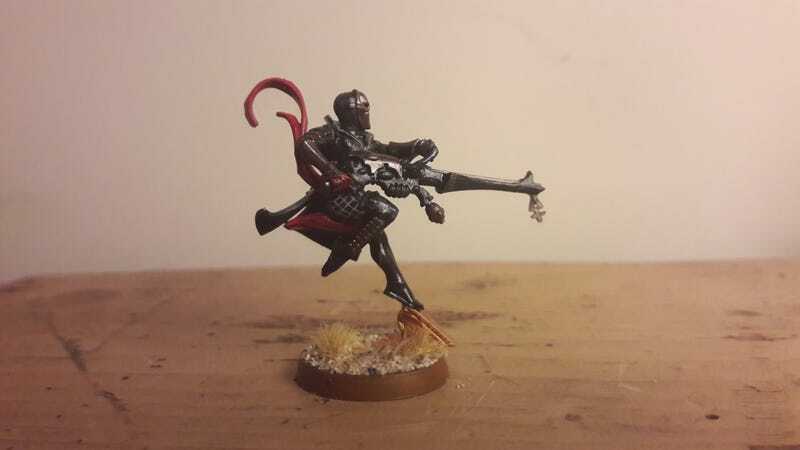 Not a daft question at all the issue is that in the Harlequin kit all of the special weapons (and swords for that matter) are right-handed. I started off with the idea of cutting off the Kiss from a right arm and gluing it onto a pistol arm that had the pistol clipped off. However, when I was looking through the Harlie kit for a suitable pistol arm, I stumbled on the Kiss arm that was fully outstretched and thought 'aside from the hand that looks identical to a left arm'. Cool stuff YW, this thread is getting full of so much character -- I can see those new Ynead models fitting right in and looking BADASS next to your creations, dude it's going to be sick! Samurai Eldar, Coming to a Croneworld Near You. 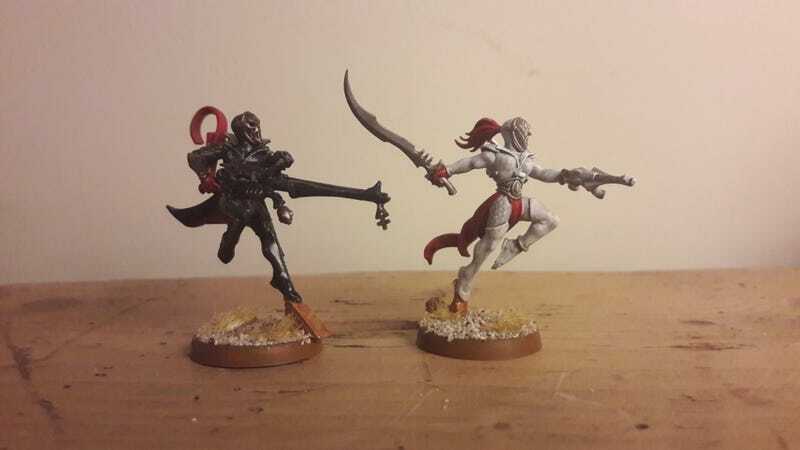 Annoyingly, after I'd painted the red hand on the Troupe Master I came up with the idea of doing the red hand not as a glove, but as blood staining from where he's pimp-slapped someone's face in. Sort of like an intense blood-spatter up his arm with it soaking into the palm, and then blood-spatter running down that side of his cloak. I don't know how I missed them, but the painted Harlequins are really beautiful. The painting on them seems a cut above (although it may just be because the lighter palette makes them more photogenic). I personally think that a red glove looks better than a festival of blood. The clean finish is such a nice counterpoint to the rest of your miniatures, I think that you stay the course with those guys. I think the look is perfect. I'm really pleased with how the Harlies have come out paint-wise. Just a smidge above the Kabalites who were the previous favourites I think it's the technique for them of laying down a base colour and then doing a couple of really thin/dry layers of colour to build up the white. Lends itself much more readily to the contours. Something I've only just discovered! Glad you prefer the red glove much easier to pull off than the bloodied hand judging by my rough testing! Well, I've got a fluff piece waiting in the wings for my Corsairs but for some reason I've been painting anything but! I am lost for words really Ynneadwraith. Actually I have lots of words I just don't know how to put them together to do justice to your fantastic modelling and painting skills. Black that looks black instead of grey is something I have rarely seen and must be really hard to achieve without obscuring any detail. Sinister, eerie, threatening, magical, special are just a few of the words that spring to mind but I can't put into a coherent sentence. One last thing - get a better camera. As much as I love the trooper - and I really love her, I think she's stunning, I'm just not sure about the Death Jester. You obviously have talent; the finish is really clean and precise and the detailing on the thigh is great, but there's just something that doesn't do it for me. I think that I like the first Harlequin because, while it is a light model, there are many layers to that light. Subtle changes in tone that bring more life to the model. With the Death Jester, I think it's probably too dark for me. There aren't those contrasts or layers, so I don't feel there's nearly as much depth. It may just be the camera and lightning, but that's what I feel. At the end of the day though, you like the model, the other guys like the model. I think it's painted well, but it's just not for me. All that said, I really look forward to seeing your work, so keep throwing those updates out there!